Acts 21:2 Having found a ship crossing over to Phoenicia, we went aboard, and set sail. The term "Phoenicia" is Greek (Phoinike, "land of dates, or palm trees," from phoinix, "the date-palm"). It occurs in the Bible only in Acts (11:19; 15:03; 21:2), the land being generally designated as the "coast" or "borders of Tyre and Sidon" (Matthew 15:21 Mark 7:24, 31 Luke 6:17). In the Old Testament we find it included in the land belonging to the Canaanites or to Sidon (Genesis 10:19; Genesis 49:13 Joshua 11:8 1 Kings 17:9). The limits of Phoenicia were indefinite also. It is sometimes used by classic writers as including the coast line from Mt. Cassius on the North to Gaza or beyond on the South, a distance of some 380 miles, or about 400 miles if we include the sweep of indentations and bays and the outstretching of the promontories. But in the stricter sense, it did not extend beyond Gabala (modern Jebleh) on the North, and Mt. Carmel on the South, or some 150 miles. The name was probably first applied to the region opposite Cyprus, from Gabala to Aradus and Marathus, where the date-palm was observed, and then, as it was found in still greater abundance farther South, it was applied to that region also. The palm tree is common on the coins of both Aradus and Tyre, and it still grows on the coast, though not in great abundance. The width of the land also was indefinite, not extending inland beyond the crest of the two ranges of mountains, the Bargylus (Nusairi Mountains) and the Lebanon, which run parallel to the coast and leave but little space between them and the sea for the greater portion of their length. It is doubtful whether the Phoenicians occupied the mountain tracts, but they must have dominated them on the western slopes, since they derived from them timber for their ships and temples. The width of the country probably did not exceed 25 or 30 miles at the most, and in many places it was much less, a very small territory, in fact, but one that played a distinguished role in ancient times. Mt. Lebanon, which forms the background of Phoenicia for about 100 miles, is a most striking feature of the landscape. It rises to a height of 10,200 ft. in the highest point, East of Tripolis, and to 8,500 in Jebel Sunnin, East of Beirut, and the average elevation is from 5,000 to 6,000 ft. It is rent by deep gorges where the numerous streams have cut their way to the sea, furnishing most varied and picturesque scenery. It was originally heavily wooded with cedar, oak, and pine trees, which are still found in considerable numbers, but by far the larger part of the mountain has been denuded of forests, and the slopes have been extensively terraced for the cultivation of vines and fruit trees and the mulberry for silk culture. The plains along the coast are not extensive, but generally very fertile and bear abundant crops of wheat, barley and other cereals, where not given to the culture of the mulberry, orange, lemon, fig, apricot and other small fruits. 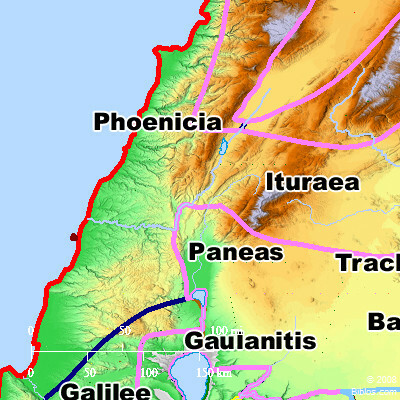 In its greatest extent Phoenicia included the broad plain of Sharon and that of Acre, between Carmel and that city, and a portion of the region watered by the Kishon, but the plains of Phoenicia, strictly speaking, are much more restricted. They are: the plain of Tyre, long but narrow, extending from Ras el-`Abyadh to Sarepta; the plain of Sidon extending from Sarepta to the Bostrenus (Nahr el-'Auly); the plain of Beirut (Berytus) between the extensive sand dunes along the shore and the rocky cape on the West and the foot of Lebanon, 10 or 12 miles long but only one or two wide, containing one of the largest olive groves in Syria; the very small plain of Tripolis, including that city and its port; and, the most extensive of all, the plain of Marathus, extending from Arka to Aradus or even beyond, including the river Eleutherus (Nahr el-Kebir). These plains furnished only a portion of the food needed by the inhabitants who were more or less dependent on their neighbors for it (1 Kings 5:11 Acts 12:20). The rivers of Phoenicia are comparatively short and small; the Litany rises in the Buka', between Lebanon and Anti-Lebanon, and finds its way in a deep and narrow gorge between Lebanon and Mt. Hermon to the South, and finally turns westward and reaches the sea a few miles North of Tyre, where it is called the Kasimiyeh. About 12 miles North of Beirut is the Dog River (Lycus), a very short stream but noted for the famous pass at its mouth, where Egyptian Assyrian and Babylonian kings engraved their monuments; and a few miles South of Jebail (Gebal) is the Adonis (Nahr Ibrahim), which comes down from 'Afqa (Apheca equals Aphek, Joshua 13:4), noted for the rites of Venus and Adonis (see TAMMUZ); and the Eleutherus, already mentioned, which runs through the valley between Bargylus and Lebanon and provides the pass between these two mountains into the interior. The other rivers are very short, but furnish a perennial water-supply to the coast dwellers. The narrowness of the land and the difficulty of expansion on account of the lofty mountain ranges and the hostility of the tribes of the interior led the Phoenicians to turn seaward for an outlet to their increasing population. We have only one instance of their attempt to colonize the Hinterland, and that ended in disaster (Judges 18). Hiram, king of Tyre, was not pleased with Solomon's gift of 20 cities in Galilee, probably not desiring to assume responsibility for their defense. The people early became mariners, and the dominion of the sea was more inviting to them, and they found room for expansion in the islands and on the coast of the Mediterranean, where they established colonies far and wide. Their first over-sea possessions were in Cyprus, the coasts of which they occupied in the 2nd millennium B.C., probably about 1500. On the southern coast they planted various colonies, such as Citium (Larnaca), Amathus, Curium and Paphos, and on the eastern, Salamis, Ammachosta and Soli, and, in the interior, Idalium and Golgi, besides other less important settlements. The evidences of the Phoenician occupation of Cyprus are numerous. The southern portion of Asia Minor also attracted them at an early date, especially the rich plains of Cilicia, and Tarsus became the most important of their colonies there. Its coins bear Phoenician types and legends, among which Baal is conspicuous. Other points along the coast were occupied, and the island of Rhodes as well as certain ports on the south coast of Crete, and most of the islands of the Aegean. Their presence in Attica is vouched for by inscriptions, and legend connects Thebes with them in the person of Cadmus, the reputed son of Agenor, king of Phoenicia. But it is doubtful whether they really colonized the mainland of Greece. They were more attracted by the lands farther to the West. The greatest of their colonies was in Africa. They occupied Utica first, probably in the 12th century B.C., and others in the same region until in the 9th century. Great Carthage was founded, which was destined to become the richest and most powerful of all and the dreaded rival of Rome. All are familiar with the story of Elisa, or Dido, the reputed Tyrian queen who led her followers to the place and founded the city. The story is perhaps legendary, but that Carthage was a colony of Tyre there is no reason to doubt. Other colonists occupied portions of Sicily, such as Motya, Erix, Soli and Panormus (Palermo). They also crossed over to Sardinia and the Balearic Isles, and planted colonies on the south coast of Spain and the northwestern coast of Africa, within and beyond the straits of Gibraltar. Of their settlements in Spain Gades (Cades) and Tartessus were the most noted, the latter being probably the Tarshish of Scripture (1 Kings 10:22). Malaca (Malaga) and Abdera, within the straits, were likewise important settlements, and there were others of less note. The Phoenicians were the same as the Canaanites, under which name they are known in the Old Testament, as well as Sidonians (Genesis 10:19 Numbers 13:29). They were of Semitic stock, if we may judge by their language and characteristics. It is true that in Genesis 10:6 Canaan is called a son of Ham, but it is also true that the language of Canaan is identified with Hebrew (Isaiah 19:18). If the early Phoenicians spoke a different tongue, they entirely lost it before their contact with the Hebrews. Their writings and all the references to them in ancient authorities show that their language was purely Semitic. As to their origin and the time of their migration to the Syrian coast, it is more difficult to determine. Herodotus (i0.2; vii.89) says that they lived at first on the Erythraean Sea, which is identified with the Persian Gulf, and modern authorities have not found evidence to refute the statement. It is quite certain that they were not the aborigines of the country, and must have come in with some of the various migrations from the East, which we know, from Egyptian and Babylonian monuments, occurred in the 3rd, perhaps in the 4th, millennium B.C. Semites are found in Syria as early as the IVth Egyptian Dynasty, about 3000 B.C., and we may fairly conjecture that the Canaanites were in possession of the seacoast as early as 2500 B.C. It is possible that they were among the Hyksos invaders of Egypt (Paton, Syria and Palestine, 67). That the Phoenicians took to the sea at a very early date and became the most skillful mariners of the ancient world is certain. Their enterprise in this direction is attested by classic writers, and the references to it in the Old Testament are numerous. This was coupled with great industry and skill in the manufacture of the various articles which furnished the materials of their extended commerce. They exhibited a boldness and audacity in braving the perils of the sea in their little ships, which, for the age, demands our admiration. They were the first who dared to push out of sight of land in their voyages and sail beyond the Pillars of Hercules into the ocean. But in their commercial dealings they were often unscrupulous, and their greed of gain often led them to take unfair advantage of the barbarous races with whom they came in contact. The purchase of the land on which the citadel of Carthage was built may illustrate the opinion of the ancients regarding them, but we ought to remember that trickery and deceit are charged against them by their enemies, who alone have handed down accounts of them. The Hebrew prophets speak of their pride and vanity (Ezekiel 28:17), and violence (Ezekiel 28:16), and Amos hints at a traffic in captives taken in war, but whether of Hebrews or not is not clear (Amos 1:9). Slaves were among the articles of merchandise in which they traded (Ezekiel 27:13 Joel 3:6), but this could hardly be charged against them as a great sin when slavery was universal. The chief reason for their being denounced by the prophets was their corrupt practices in worship and the baleful influence of the Baal and Astarte cult introduced by them into Israel through Ahab's marriage with Jezebel (1 Kings 16:31-33). This evil influence was felt even after the captivity when the rites of the Phoenician Tammuz were practiced in Jerusalem (Ezekiel 8:14). But the earlier relations of the Phoenicians with Israel in the days of David and Solomon were friendly and mutually beneficial. On the whole the judgment of history assigns to this people a high position for their enterprise and skill in carrying on their trade, and in being the pioneers of civilization in many of the Mediterranean lands, especially by their introduction of alphabetical writing, which was by far the most valuable of all their contributions to the culture of the ancient world. Bronze was a specialty of the Phoenicians, and they were for centuries the leading producers, since they controlled the sources of supply of the copper and tin used in its manufacture. The remains of their bronze manufactures are numerous, such as arms for offense and defense, knives, toilet articles, axes, sickles, cups, paterae, and various other household utensils. Articles for artistic purposes are not of high value, although the pillars named Jachin and Boaz, the molten sea, the bases, layers and other articles cast by Hiram of Tyre for the temple of Solomon must have exhibited considerable artistic merit. Their bronze was of good quality and was tempered so as to serve well for edged tools. The composition was about 9 parts copper to 1 part of tin. They seem also to have made iron (2 Chronicles 2:14), and some specimens have come down to us, but we cannot judge from their scarcity as to the extent of their manufactures in this metal, since most of the articles have perished by corrosion. The architecture of the Phoenicians was characterized by massiveness, rather than elegance. The substructures of some of their temples and castles are cyclopean, like those of the temple at Jerusalem (1 Kings 7:10), and other examples are found at Sidon, Gebal, Marathus and other places in Phoenicia itself. Their work seems lacking in symmetry and grace, showing a want of aesthetic taste. Trade was the very life of Phoenicia. The contracted limits of the land forbade any extensive agriculture, and the people were forced to get their living by other means. They applied themselves to industrial arts, and this led them to seek the means for distributing their wares. Trade was essential to them, and they sought outlets for it by sea and land. Their position was especially favorable for commerce. In the very center of the ancient world, with the great rich and populous nations of antiquity at their back and on either side, they faced the young, vigorous and growing nations of the West, and they served them all as carriers and producers. Their caravans threaded all the well-beaten routes of the East, the deserts of Arabia and the mountain defiles of Armenia and Asia Minor, and their ships pushed boldly out to sea and explored the Mediterranean and the Euxine and did not hesitate to brave the unknown dangers of the Atlantic and perhaps even penetrated to the Baltic, emulating the mariners of a later day in their zeal for discovery and search for new avenues of trade. Could we find a detailed account of their voyages and discoveries, it would be a most interesting document, but we have little except what others have written about them, which, however, gives us a pretty fair idea of the extent of their commercial enterprise. The prophet Ezekiel has given us a remarkable catalogue of the wares of Tyre and of the countries with which she traded (Ezekiel 27). There we have mention of nearly all the regions of Western Asia, Egypt, Greece and the islands, and Spain, indicated by the names of races, tribes and countries. The materials of their traffic include the most important known to the ancient world, the products of agriculture, such as wool, linen, oil, balm, spices, frankincense, wine, corn, etc. ; of metals, such as gold, silver, copper (brass), tin, iron, lead, etc. ; precious stones and the articles of manufacture, the "multitude of handiworks," which they were so skillful in producing. They traded in animals also, horses, mules, lambs, rams and goats, and, what is less to their credit, in the persons of men (Ezekiel 27:13). The range of their trade was much wider than is indicated by Ezekiel. We know they reached the Scilly Isles in Britain, and probably the Baltic, whither they went for amber, though this might have been brought overland to the Adriatic and received into their ships there. They passed along the western coast of Africa as far as Cape Non, and perhaps farther, for Herodotus tells us that Pharaohnecoh dispatched a crew of Phoenician sailors to circumnavigate Africa, which they accomplished in 3 years. We know that they had a fleet in the Red Sea sailing from Elath or Ezion-geber (1 Kings 9:26, 27), and it is quite possible that they were allowed by some of the kings of Egypt to avail themselves of ports on the other branch of the Red Sea. They must have visited the eastern shore of Africa and perhaps struck across the Indian Ocean, after skirting the coast of Arabia, and thus carried on trade with India. The Ophir mentioned in connection with these voyages has not been definitely located, but was perhaps in Southern Arabia, though possibly in Southeast Africa. The Phoenician alphabet comprises 22 letters and is deficient in signs to indicate vowels, which were left to be supplied by the reader. This defect is common to the Semitic alphabets, but was soon remedied when the Greeks adopted the Phoenician. Some of the letters have to serve for two sounds, such as the signs for "s" and "sh", for "p" and "ph", for "t" and "th"; besides, there is a redundant sign for the sound of "s". Also the sounds of "y" and "w" are unrepresented. The origin of the letters is probably to be found in the hieroglyphic signs for words and syllables used by the Egyptians and others, since the similarity of some of them to these signs is evident, but in some cases it is more likely that the Phoenicians adopted hieroglyphics of their own. Thus the first letter, 'aleph, which means "ox," was evidently derived from the picture of an ox's head and then reduced to a conventional form. The Phoenician alphabet and language were common to the Canaanitish tribes and the Hebrews, as we know from the many inscriptions found in Western Asia. The Moabite Stone testifies to their use East of the Jordan, and the Siloam Inscription likewise for Israel, and the same characters have been found in North Syria. This would be natural, for people of these regions had become largely Semitic by the 9th century B.C., when we suppose that the Phoenician alphabet was in general use. Ashtoreth (Phoenician `ashtoreth) was the great Nature-goddess, the Magna Mater, queen of heaven (Jeremiah 7:18), and as Baal was the solar deity, so she was often represented under the lunar aspect, Ashteroth-karnaim, "Ashteroth of the two horns" (Genesis 14:5). Sometimes she is represented holding the dove, the symbol of fecundity, of which she was the goddess. She was commonly identified with Aphrodite or Venus. She, like Baal, had temples everywhere, and kings were sometimes her high priests, and her worship was too often accompanied with orgies of the most corrupt kind, as at Apheca. Among the other gods we may mention: El, or Il ('el originally the designation of the supreme God, but afterward a subordinate deity who became the special divinity of Byblus (Gebal), and was regarded by the Greeks as the same as Kronos. Melqarth (melqarth, "king of the city") originally was the same as Baal, representing one aspect of that god, but later a separate deity, the patron god of Tyre whose head appears on many of its coins, as well as his symbol, the club, since he was identified with Hercules. Herodotus describes his temple at Tyre to which he attributes great antiquity, 2,300 years before his time. Dagon (daghon) seems to have been the tutelary deity of Aradus, his head appearing on the early autonomous coins of that city. He seems to have been regarded as the god of agriculture by the Phoenicians, rather than of fishing as generally supposed. Adonis ('adhon, "lord") was regarded as the son of Cinyras, a mythic king of Gebal and the husband of Ashtoreth. The myth of his death by the wild boar led to the peculiar rites celebrating it, instituted by the women of Gebal at Apheca and on the river named after him (see TAMMUZ). Esmun ('esmun) one of the sons of Siddik, the father of the Cabiri, was especially honored at Sidon and Beirut. At Sidon a great temple was built in his honor, the ruins of which have been recently explored and various inscriptions found dedicating it to him. His name signifies "the eighth," i.e. the eighth son of Siddik, the others being the Cabiri, or Great Ones, who were regarded as presiding over ships and navigation, and as such were worshipped in many places, although their special seat was Beirut. Although they were called "Great" they are represented as dwarfs, and an image of one of them was placed on the prow, or stern, of each Phoenician war galley. The goddess Tanith (tanith) occupied a lofty place in the pantheon, since in inscriptions she takes the precedence over Baal when the two names occur together. She was especially honored at Carthage and to her most exalted names are given, such as "the parent of all"; "the highest of the gods"; "the mistress of the elements," etc. Besides some other gods of less note originally worshipped by the Phoenicians, they introduced some foreign deities into their pantheon. PHENICIA (pron. fe-nish'ya), it was a narrow sea coast strip of country on the n.w. of Palestine, on the Mediterranean seashore and had Tyre, Sidon and Accho as its chief towns. Its length was from Arvad to Mt. Carmel, 150 ms., and inland it extended about 10 ms. It, at one time, included Dor on the s. of Mt. Carmel. It was included in the tribe-district of Asher but never conquered by that tribe. PHENI'CE, another name for Phenicia, Acts 11:19, 15:3. Also a town and harbor on the s.w. shore of Crete, now called Phinneka near point Lutro, 42 ms. w.n.w. from cape Matala, about 32 ms. from the w. end of the island.